At dawn this date in 1550, two sons* of Jon Arason were beheaded at Skalholt, followed by the energetic sextegenerian prelate himself — cementing Lutheranism in Iceland. As bishop of the northern diocese of Holar and one of the most powerful pols in Iceland, Arason did what he could to maintain papal authority when the Danish King Christian III began pushing Protestantism. But his rival Dadi Gudmundsson turned the tables on the man who was becoming the de facto ruler of the island by ambushing him at a parley. The cleric and the two sons, having been declared outlaws months before by Danish decree, were executed on that basis without trial, lest holding them for the planned hearing the following spring enable their supporters to rally. Arason’s beheading was reportedly botched. Legally doubtful but practically effectual, the axe that (eventually) decapitated the divine did likewise to his flock. Lutheranism thereafter settled comfortably into the ascendancy: Iceland would not have another Catholic bishop for nearly four centuries, by which time its Catholic population had shrunk near the vanishing point. Although his faith didn’t have legs on the island, Arason reads very easily as a proto-nationalist figure and political actor; he’s been well-loved by Protestant, Catholic, and irreligious posterity alike. In everyday conversation in Iceland, that phrase is still used to tease someone who has just stated the obvious. * Although this is well into the period when Catholic clergy were supposed to be practicing celibacy, Arason’s indifference to this particular mortification of the flesh is just another bit of his charm. With his mistress Helga Sigurdardottir, he sired nine sons and daughters, marrying them into politically advantageous allegiances where possible. 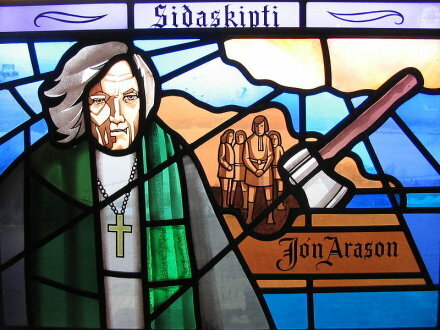 At least eight subsequent Lutheran bishops sprang from his seed; by the present, “virtually all Icelanders can validly claim direct descent” from Jon Arason, according to Iceland, the First New Society. ** Jon Arason was also a notable poet. Ljomur, whose attribution to Arason is speculative, can be enjoyed for free here. † More particulars about the Icelandic political chessboard are available in this 19th century text (the pdf is easier on the eyes than the text), or in “An Icelandic Martyr: Jón Arason,” by Thomas Buck, in the Jesuit publication Studies: An Irish Quarterly Review, Vol. 46, No. 182 (Summer, 1957), pp. 213-222.